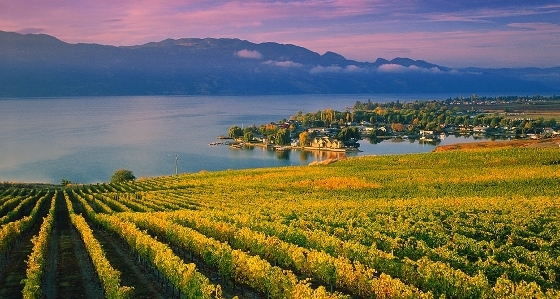 Kelowna is in the heart of British Columbia’s beautiful Okanagan Valley, regarded as one of the most scenic regions in Canada. People are drawn to the great four-season weather, stunning landscapes and boundless opportunities for outdoor recreation – water sports, cycling, golfing, skiing, hiking and so much more. Rich in culture, the Okanagan hosts brilliant wine festivals, extraordinary art, music and theatre events, and offers all the dining and entertainment you would expect from one of the most vibrant regions in the B.C. Interior. Geographically speaking, most expats moving to Kelowna have no reason to complain. It is ideally situated for lovers of any outdoor activity you can think of. Surrounded by miraculous mountains and with the beautiful Okanagan Lake separating West Kelowna and Kelowna, Kelowna has the perfect natural commodities for winter and summer activities. To see some of the most popular activities that Kelowna has to offer, take a look at Things to Do in Kelowna. Beyond Kelowna’s picturesque scenery, a large part of its livability also manifest from the physical beauty and public cleanliness of the city itself. To put it simply, Kelowna is exceptionally charming. Spawning gardens, spacious public squares, niche shopping, vineyards and orchards of all sort makes everyday life in Kelowna very pleasant. All orchards and vineyards thrive within minutes from downtown making life that much enjoyable. Let’s move forward to establish a bit more about Kelowna’s modern context. Settle neatly in the center of the Okanagan Valley and close to the USA border, Kelowna finds itself not only in a positon of immense natural beauty, but also at the greater cultural crossroads, where Canada meets the USA. Relatively undiscovered, Kelowna has gained a spot on the top 10 busiest airports of Canada in 2015. Kelowna airport connects to major North America cities including Seattle, San Francisco, Toronto, Vancouver, Hawaii, etc. Kelowna’s setting, thus, provides more than just a pristine natural backdrop; its location has played a deeply influential role in the city’s hybrid cultural identity as well. Kelowna has shown nothing but development growth over the years. The city of Kelowna understands the important of economic development and are committed to attracting and retaining businesses, but also making decisions that benefit the community. Kelowna has invested and create 1000’s of jobs by balancing investments in infrastructure for today and tomorrow. The City of Kelowna has developed a long-term infrastructure plan for improving water quality and improving infrastructure. The plan can be found at the The City of Kelowna. Besides the cities investments, Kelowna has seen foreign investors taken a keen interest in real estate, mostly in commercial properties as the city offers high capitalization rates. As real estate markets, such as in Vancouver and Toronto become financially inaccessible, foreign stakeholders, such as Asian investors have been relocating their money around the Okanagan for their better yields of capitalization. Some recent purchases from Asian investors include, the former Monaco multi-family site, which sold for $6.5 million, the 125-room Lake Okanagan Resort, which ended up selling for more than $10 million, and a commercial property on Bertram Street that went for $2.4 million. Kelowna is in the core of the Okanagan Valley and is part of the Regional District of Central Okanagan which includes the areas of West Kelowna, Lake Country, and Peachland. Kelowna Is the largest community in the Central Okanagan district with a current population of 127,380 representing a percentage change of 8.6% from 2011. This compares to the national average growth of 5.9%. Kelowna has a land area is 211.85 square kilometers with a population density of 601.3 persons per square kilometers. This compares to the provincial land area of 922,509.29 square kilometers with a population density of 4.8 persons per square kilometer. Kelowna has currently 57,433 private dwellings and 53,903 of the private dwellings occupied by usual residents. For a more detail population and demographic census check Statistics Canada census report for 2016. There are various types of properties you can buy or rent in Kelowna. All types of Real estate in Kelowna has been, and continues to be, a great investment. If you bought your primary residence years ago, and have enjoyed tax-free growth since, you’ve probably made a great return on your home. Real estate is a relatively safe investment; it’s easily understood, and it’s well proven that the long-term investment of buying is preferable to renting. Below is a list of several housing types, but not limited to Kelowna. Whether you want to move or visit Kelowna, remember that Kelowna offers great wine touring, restaurants, and endless outdoor recreation opportunities. The city is home to outstanding golf courses, scenic trails, and plenty of beach and water-based fun. At 10:00 am EST, Wednesday March 1, 2017, the Bank of Canada again maintained their overnight rate which means no change to your interest rate. This is great news to start the year off as you continue to benefit from low rates. Let’s not forget that this is a great time to take advantage of historical low rates and chat to a financial advisor about a Tax Free Savings Account or some RRSP contributions to trigger a potential income tax refund; you might have missed the RSP deadline for this year but it is never too late to start saving and planning for the future. If you don’t have a financial advisor, let me know and I’d be happy to recommend one to you. On another note, are you carrying a balance on any lines of credit or credit cards right now where the interest rate is over 3%? If so, this is the perfect time to chat about a potential debt consolidation or refinance – let’s start saving you unnecessary interest and get to your mortgage burning party sooner! Maybe you are planning a renovation project soon or purchasing a second home or rental property – chat to me about your options … I'd be happy to make those plans into a reality. Given the mixed messages of both positive growth versus a slow down in some sectors, it is still anticipated that prime rates won’t start increasing until well into 2017 but we are being given the heads up that they will start increasing eventually. Remember, that any increase to the prime rate since 1992 has only been by 0.25% at any ONE time, so you won’t see a large significant increase all at once. Fixed rates haven’t changed at all since the last announcement, and are around 2.59% to 2.89% for a five-year fixed term. Also, remember that the prime rates and fixed term rates are impacted by two different sets of economic drivers and so increases in fixed rates doesn’t always mean the same increase in prime rates and vice versa. Based on this recent announcement, and the anticipation that the prime rate will still remain low for a while now, unless you feel otherwise, I’d recommend that you remain with your current variable rate product as the interest is still lower than a fixed term rate right now. However, if having a fixed payment is important to you, call me so I can calculate what your new payment would look like and also if it is suitable for you. I’ll be in touch again for the next announcement on April 12, 2017. I wonder if I can ask a favour, if you hear a friend or family member talk about going thru a financially tough time – maybe I can help with some budgeting, credit counselling and debt consolidation options for them. It is also that time of year that many think about what they want to accomplish this year – if buying their first home is on the “wish list”, would you mind passing my contact information on to them – this is very much appreciated.